A 123-page draft document for a partnership government has been given to independent TDs this evening. FINE GAEL HAS PROPOSED an increase in the minimum wage, dismantling the HSE, and an action plan for housing in a wide-ranging document aimed at governing in partnership with independent TDs. After more than 50 hours of talks with 15 independent deputies at Government Buildings over the past two weeks, the party has circulated a draft foundation document for “a new partnership government”. The draft will be considered by independent TDs before they meet again with Fine Gael in the morning. It is also being discussed by the Fine Gael parliamentary party tonight. 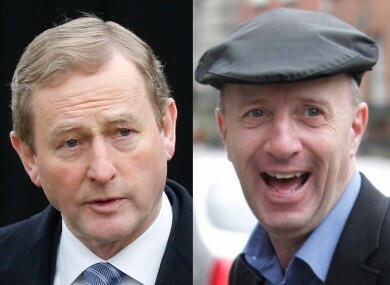 It comes as Taoiseach Enda Kenny told the independent TDs this evening that he plans to meet with Fianna Fáil leader Micheál Martin tomorrow. This will come after what’s expected to be a stalemate when the Dáil tries to elect a Taoiseach. I welcome the fact that the Taoiseach has confirmed that he will meet with Deputy Micheal Martin leader of Fianna Fail tomorrow. Despite the extensive negotiations, independent TDs have indicated they will not back Kenny as he attempts to win the vote for Taoiseach tomorrow. Many have repeatedly stated that Fine Gael and Fianna Fáil need to engage in negotiations on the formation of government – something which has so far failed to happen – bar one phone call last week. The 123-page document produced by Fine Gael covers 16 separate areas with extensive sections on housing, health, rural affairs, education, disabilities and political reform. It makes no reference to the situation surrounding Irish Water and water charges. The only mention of the utility is in the context of a commitment to protecting the €42 billion capital investment plan, which includes a €5.5 billion plan set out by Irish Water to upgrade the “dilapidated national water infrastructure”. The document proposes that the Eighth Amendment be considered by a Citizens’ Assembly which could also examine introducing fixed-term parliaments. Referendums on ‘a woman’s life within the home’, blasphemy, the Universal Patent Court and giving a constitutional role the Ceann Comhairle are also proposed. A pledge to expand broadband coverage to 85% of the population by 2018 and 100% by 2020 is also contained in the document. According to the document, the new government will appoint a cabinet minister for housing to provide “political leadership on resolving the housing crisis”. Together with an Oireachtas housing committee, they will draft a new ‘action plan for housing’ to tackle the crisis. The new government would accelerate the delivery of the social housing strategy with 18,000 additional housing units by the end of 2017 and 17,000 additional housing units by the end of 2020. Among other measures proposed include linking funding for local authorities to their return of vacant social housing units and the examination of tax relief proposals for landlords who deliver a greater supply of private rental accommodation. The government pledges to deliver 500 rapid delivery housing units to “end the use of unstable long-term emergency accommodation, such as hotels and B&Bs, for homeless families”. The new government would also spend an additional €6.75 billion to deliver public services by 2021. There are promises to provide “sustainable increases” in public pay and pensions and improve welfare payments for the elderly, disabled, sick and carers. It pledges to continue reductions in personal tax rate and notes the “continued phasing out of the USC”, as well as seek support to increase the minimum wage to €10.50 per hour over the next five years. There is a promise to reduce the rate of unemployment to 6% by creating 200,000 extra jobs by 2020, including 135,000 outside of Dublin. This will also facilitate the return of 70,000 emigrants, the document states. On education, the new government would introduce a second free pre-school year and raise the school starting age to five, reduce the pupil teacher ratio in junior and senior infants and increase the mandatory school leaving age to 17. No small school would be closed against parents’ wishes, the document claims. On justice issues, there is a pledge to increase garda numbers to 14,000, increase numbers in Garda reserve and support investment in CCTV at key locations along the road network and in urban centres. Government discretion to appoint judges outside of those recommended by the Judicial Appointments Advisory Board would be scrapped. The new government would create a department of rural affairs with a cabinet minister to head that department. The document also contains a section on ‘empowering women’. Under these plans, large companies would be required to carry out wage surveys, the Defence Forces would be tasked with increasing the number of females by 50% and there is also a pledge to increase the number of women on state boards to 40%. Email “This is how Fine Gael would govern with independent TDs - but what about Fianna Fáil?”. Feedback on “This is how Fine Gael would govern with independent TDs - but what about Fianna Fáil?”.